"To find out what we are, we must first find out who we are and, more importantly,WHEN we are." Ever had a bad day where one thing just steamrolls into another, and, before you know it, you're in the middle of a complete, personal hell? Well, if you haven't, you're lucky. In the case of Brian Stimpson, the main character in Clockwise, the term 'bad day' takes on a whole new, deeper meaning. Mr. Stimpson (Cleese) is incredibly obsessed with organization and punctuality. He lives his life by the clock and believes that only rigid adherence to both it and a stiff set of personal standards can one achieve greatness. However, when his seemingly simple plans go awry, his life becomes the textbook example of a linear disaster. Stimpson, the headmaster of a tightly run public school, is set to give an important speech at a conference of headmasters. Having been appointed the chairman of this conference, Stimpson sees himself as the shining example of public schools done right, and hopes to prove it by being an exemplary guest. The problem is, in his haste to get to the conference, he takes the wrong train; and that's just the beginning. He loses his carefully worded speech, can't get a proper ride, is assumed to be having an affair with one of his students, is suspected of thievery, and is wanted by the police. He takes one wrong turn too many and fate intervenes making his trip one mishap after another. He tries to keep his cool and adapt to the situation, but the insanity of it all is very hard to bear. Something of a hidden gem in the realm of British comedy, Clockwise was given a rather unenthusiastic run in England, while it had virtually no presence in the US, where one would have imagined distributors would have marketed up Cleese'sinvolvement with Monty Python. Interestingly, it is also one of Cleese's finest non-Python works, yet he himself didn't write it; great English playwright, Michael Frayn penned the hectic story. The film is definitely given life by Cleese's characterization, which though limited, perfectly showcases what this Stimpson fellow is all about. Fans of John Cleese's television series, Fawlty Towers, will probably see more connections to that than his work with Python. He is always at his best when playing someone upset, frazzled, and brought to the end of their rope in frustration. In a way, Clockwise is uncomfortable to watch because the endless series of bad events is almost too much to witness. While you feel sorry for Mr. Stimpson, he's also getting what he deserves after his harsh treatment of co-workers and students. 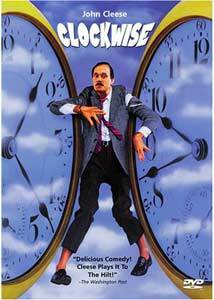 Like all great comedies, though, the chaos is what generates the laughs, and this is definitely Cleese at his best. He manages to perfectly balance the inner frustration of his character with his calm exterior, so when he does crack, it's wonderfully inserted into the story. Luckily, the supporting characters also manage to provide the perfect background for all this to happen, and there's an interesting cameo by Joan Hickson (best known as Miss Marple) as a constant gossiper. Theelements all combine into a very enjoyable comedy. Image Transfer Review: Although a little aged and grainy at times, the transfer is very smooth and natural, offering visuals that have no overly distracting problems. Colors are very rich and the source print is reasonably clean, save for a few reel change marks. Anamorphic enhancement has given a certain fleshed-out quality to the image, and given that much of the film takes place in the outdoor countryside of England, this makes the cinematography very nice, though simple. Audio Transfer Review: The Pro-Logic Mono audio track is basic, but functional. Dialogue (which comprisesmost of the film) is perfectly audible and well presented. The musical score sounds very thick and rich, surprisingly so, and there are really no complaints here. Multi-channel enchancements really wouldn't have added much to the movie. Extras Review: There is a 13-minute featurette entitled Clockwatching with Mr. Cleese, which is a new interview conducted for the DVD with John Cleese. He recalls the circumstances of making Clockwise and discusses how it has been one of his few leading roles. For being a short interview, it is produced extremely well with photo stills, clips, and other material from various points in Cleese's and Michael Frayn's career being presented in a manner suggesting almost a short making-of feature. There is a biography for John Cleese and the original Clockwise trailer rounding off the disc. The keepcase contains a cardstock reproduction of the original poster (in German) and chapter listings on the reverse side. Clockwise is a must-have for those who've appreciated the Python boys' solo work since the late 1970s/early 1980s. John Cleese, now primarily serving as a supporting actor, gets one of his best lead roles here. Fine comedy from a fine group of British collaborators.